The Aurora Chapter was organized on October 12, 1912, with thirteen members. The organizing regent, twenty-three year old Lucy Stevens Nelson, was the youngest in the state to hold this office. The chapter soon grew to more than 100 members. When the chapter hosted the 33rd Illinois State Conference in March 1929, the event stimulated such interest in the chapter that twelve new members joined. Chapter markings include the graves of Revolutionary War soldiers W.R. Miller (West Aurora Cemetery) and Frederick Vaughn (Spring Lake Cemetery). In 1924-25, a boulder was placed to mark the spot near Oswego in Kendall County, where an early French mission once stood. Aurora is proud to have in the Smithsonian Institution 150 pieces of pattern glass given by member, Mrs. Justus Johnson, and to the NSDAR Museum, a framed daguerreotype of her Revolutionary War ancestor. An original diary from 1864, was sent to the Americana Room and a leather paymaster's pouch was sent to the DAR Museum by Miss Miriam A. Williams. The Aurora Chapter contributed organizational and membership support in 1988, to the newly-formed Elias Kent Kane Chapter, located in the "up the Fox River" area, in St. Charles. In 1920, the Laetitia Wright Society C.A.R. was organized as Charter #13 with twenty members. It disbanded March 10, 1927, and was reactivated September 27, 1964, as the Waubonsie Society C.A.R. with twenty-seven members. It disbanded again in December 1992, and reorganized December 5, 2009, with seventeen members. Margaret Bernard is Reorganizing Society President. Lorna Fischer Wright, Honorary Senior State President is Reorganizing Senior Society President. Serving the state and national: Fannie Hopkins Peffers, State Regent (1931-32), state registrar (1924-26); Mae Morris Maury, State Regent (1947-49), state recording secretary (1937-39); and Helen Drew Mitchler, State Regent (1999-01), Vice President General (2005-08), state vice regent (1996-98), state organizing secretary (1986-88), and District IV Director (1993-95). Mrs. Mitchler, a "Daughter of Distinction," was appointed national chairman of the national defense committee (2004-07); Helen F. Daily, state registrar (1919-21); Lorna Fischer Wright, state registrar (1999-01) and Eileen Kincaid King, District IV Director. 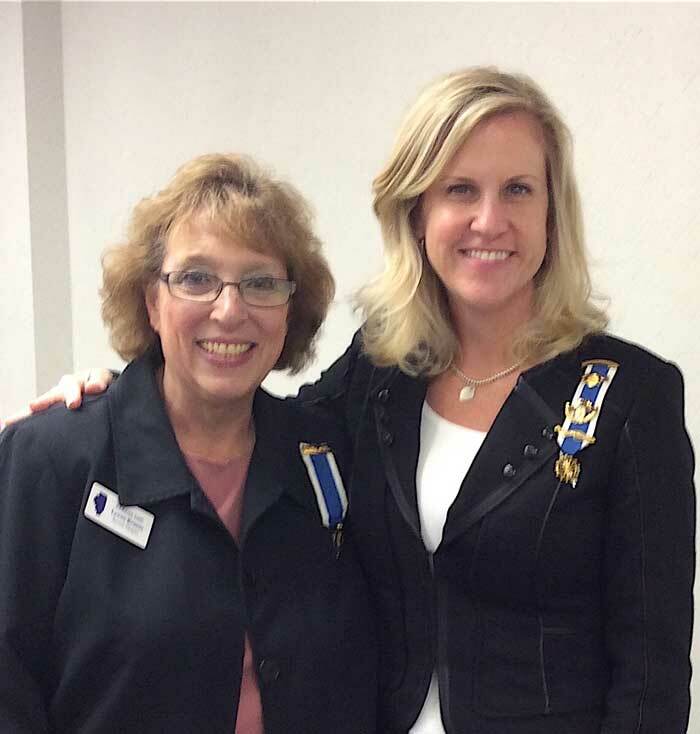 Kelly Carey is currently serving the Illinois State Organization as assistant state treasurer. In 1987, while serving the first of two terms as regent of the chapter, Linda Stayner Thomas was honored as Illinois Outstanding Junior and as a North Central Division Outstanding Junior. Lauri Carey was honored as Illinois Outstanding Junior 2007. The chapter annually presents youth awards. DAR Good Citizens medals are awarded to a number of area high schools and American History essay awards are presented to younger students. Junior ROTC medals are awarded to students at Marmion Academy, Mooseheart, East Aurora High School and West Aurora High School. Active support for veterans at the Edward Hines, Jr., Veterans Administration Hospital is given with money, clothing, books and many signed Christmas cards. The chapter also supports DAR Project Patriot and the Illinois Honor Flight Project. The Aurora Chapter has partnered with the United States of America Vietnam War Commemoration. Since 2007, Flag Day has been commemorated with a meaningful Flag Retirement Ceremony. The Waubonsie Society C.A.R. members are active participants in this patriotic event. Over the past ten years, the chapter has experienced exciting membership growth. At the 113th State Conference, chapter registrar Margaret Sopp was announced Volunteer Genealogist of the Year and was National Runner-up at Continental Congress. Margaret has served as a Continental Congress Volunteer Genealogist, providing genealogical guidance to Daughters attending the annual event, since the inception of the program. Meeting programs include topics of genealogy research, women’s issues, national defense, DAR supported schools, and special visits by State Regents and District IV Directors. 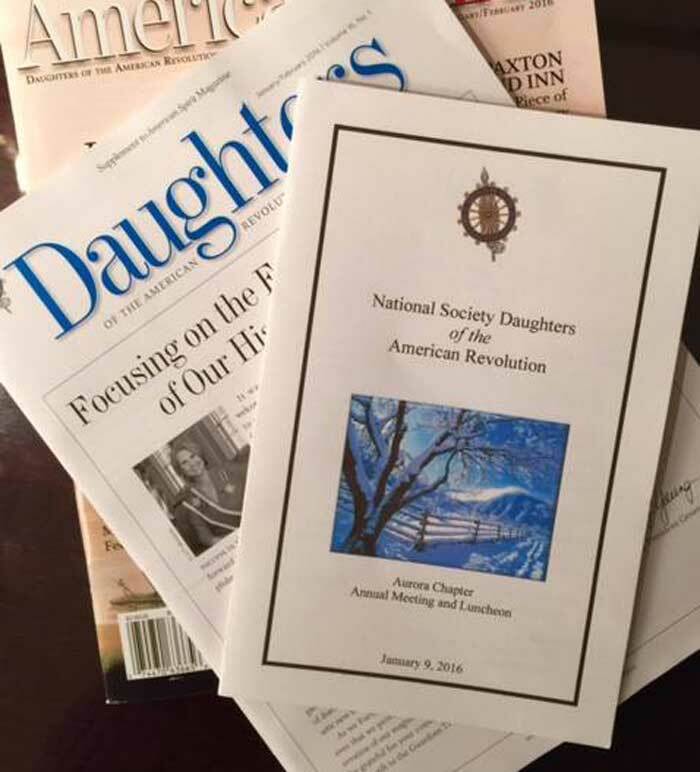 A large number of chapter members attend DAR Days, District IV meetings, Illinois State Conference, and Continental Congress in Washington, D.C. The Aurora Daughters celebrated a successful century of history with their 100th year anniversary on October 12, 2012. Source: "History of the Illinois State Organization, Daughters of the American Revolution," compiled in 2010, by Sara Steckler Caddell, IL DAR State Historian and edited by Martha R. Zimmerman, Honorary State Regent, pp. 122-124. Updated April, 2016. For more information about our meeting times and locations, contact us.